The ShadowFX library provides a scalable and GCN-optimized solution for deferred shadow filtering. Currently the library supports uniform and contact hardening shadow (CHS) kernels. Version 2.0 of the library now supports both DirectX® 11 and DirectX® 12. The ShadowFX API is unified across D3D11 and D3D12, allowing an easy transition to D3D12. Samples are provided for both D3D11 and D3D12 versions. 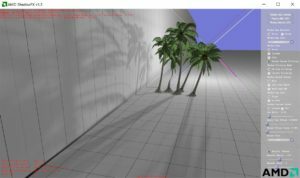 The ShadowFX library can also serve as a sandbox for experiments with other shadow filtering techniques.